English language dominate majority content on the internet. However, with spread of the internet: non-English speaking users are creating content in their native language on the internet. Now anyone can blog in Hindi, Punjabi, Tamil, Telugu and other Indian languages using ‘easy to use’ language Transliteration features. Using your regular keyword, mouse and computer – you can write and create online blog website in any language of your choice. 1. To get started, open Blogger website [www.blogger.com] to create a new account or login into existing account. Once logged into Blogger Dashboard, you can add new blog easily. Click ‘Goto Post List‘ button of specific blog listing in the Blogger Dashboard. 2. Then enable Transliteration feature in Blogger Dashboard. 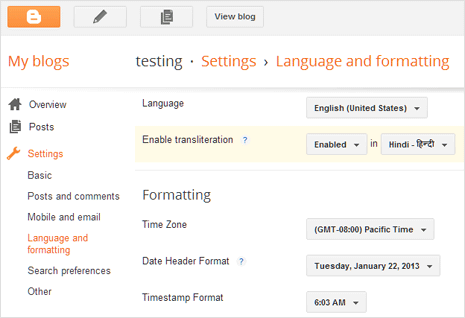 Goto Settings > Language and formatting page and enable “Transliteration” feature for your blog. 3. Once you enable this feature, you can will see new button in the post editor. Using this button you can turn On or Off the transliteration feature in Blogger for typing content in the native language. Besides Blogger service, WordPress is also hot favorite blogging platform among bloggers. It comes in two formats: online WordPress.com service (similar to Blogger) and WordPress.org free download-able software which you can install on your own server. 1. WordPress.org software download – You can find official documentation at WordPress Codex website or download localized Hindi WordPress software from wordpressindia.com website (this is not official WordPress automatic release though). You can also use specific plugins for language support on standard WordPress install, checkout plugins like: Indic, Indic IME and Indic Language Comments. 2. 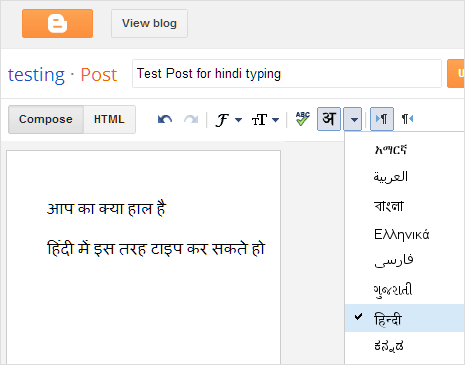 WordPress.com users can use third party tools for typing blog posts in Hindi and other languages. Official support page for Transliteration recommends using: Transliteration bookmarklets, Google Transliteration Editor, Google Transliteration Google Input Method services. Thanks for sharing. really needed it.